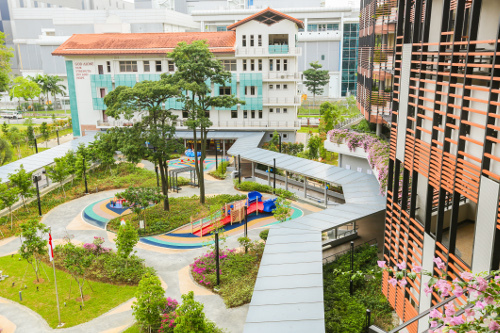 A space where children can play and interact with the elderly – Singapore’s very first intergenerational playground in a nursing home was unveiled at St Joseph’s Home yesterday (28 Aug 2017). The $100,000 sum is the first donation from SMRT’s Gift of Mobility Fund announced two weeks ago. The government will match the sum dollar for dollar to help St Joseph’s Home support other mobility-related needs as the home expands to its full capacity of over 400 residents. The playground will provide a common space for the home’s residents and children to interact and play together, improving their overall wellbeing.Its unique features include a see-saw with a ramp, and a merry-go-round that has wheel-locks for wheelchairs and custom-built seats for toddlers. 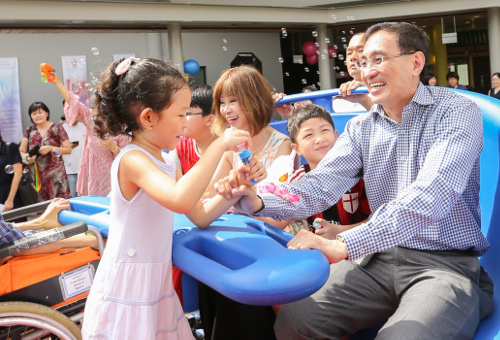 Senior Minister of State, Ministry of the Environment and Water Resources & Ministry of Health, Dr Amy Khor, President and Group CEO, SMRT Corporation, Desmond Kuek, joined staff and residents for the official launch of the playground. Speaking at the event, Mr Kuek said SMRT was encouraged by the success of the first two SMRT-sponsored playgrounds located at Bishan-Ang Mo Kio Park and Ghim Moh. “So when we heard about the intergenerational playground at St. Joseph’s Home, we jumped at the opportunity to help along in this very meaningful project to better connect our community,” he said. “It is most timely, as we are starting a Gift of Mobility Fund to commemorate our 30th anniversary, and have pledged $30 million in cash and contributions in kind over the coming years to aid those with mobility needs in our community,” he added. In line with SMRT’s vision of ‘Moving People, Enhancing Lives’, the Gift of Mobility Fund will help those in need keep on the move and extends our commitment to providing safe reliable and comfortable rides to those who need more care and support on their travel journey. At SMRT, we believe in Moving People, Enhancing Lives. We believe in giving back to society and fostering a fair and inclusive community. 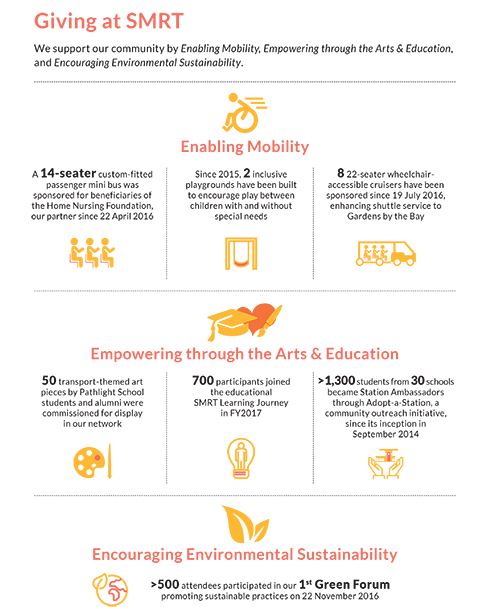 Three pillars – Enabling Mobility, Empowering through Arts & the Education, and Encouraging Environmental Sustainability – form the foundation of our Corporate Social Reasonability efforts. 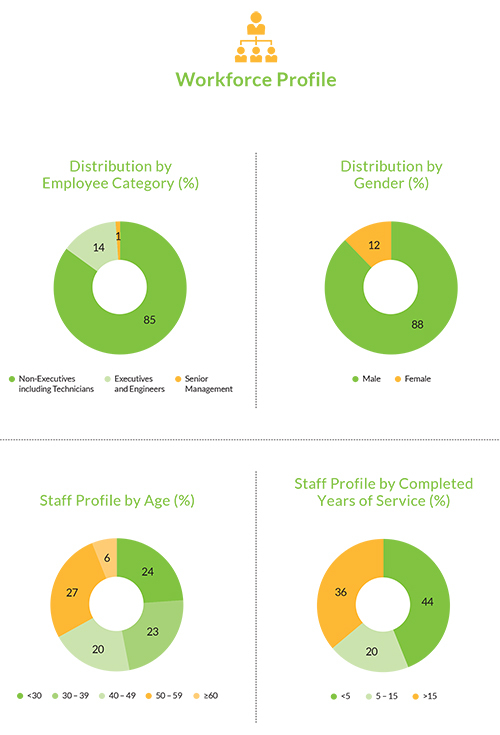 Close to 70% of the patients HNF serves have mobility issues or are bed-bound. 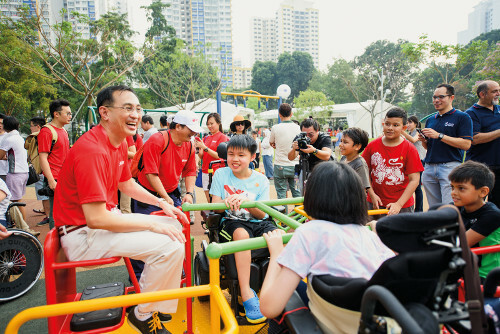 For patients in wheelchairs, such as 59-year-old Lim Ah Moi, the custom-fitted passenger mini bus sponsored by SMRT offers the gift of mobility so they can attend social and recreational events. Year luncheon for beneficiaries upon hearing about the sponsored mini bus. Trusten was one of the students from Pathlight School who contributed his artwork. 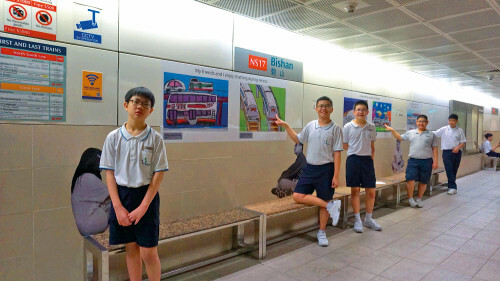 Trusten’s art piece was displayed at Bishan MRT station, along with 18 other paintings by his fellow schoolmates. Get more details on our CSR efforts in the SMRT Trains Ltd. Operations Review 2017. 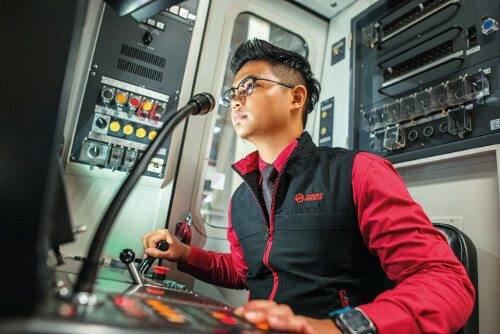 SMRT Trains has a workforce of 5,200 to support our goals of delivering service and reliability to our commuters. Stationed across the island, with some starting their day long before the first train service, our people are the cornerstone of our success. 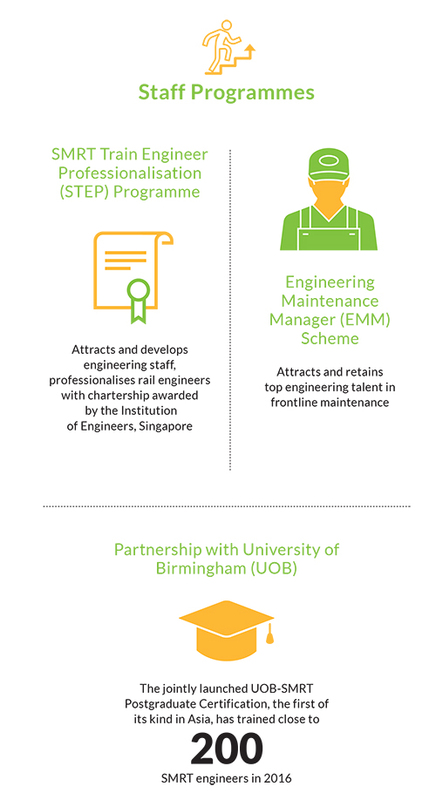 As SMRT Trains’ headcount increases to meet growing capacity and maintenance needs, we continue to shape a lean and productive workforce. Our people play a critical role in meeting commuter service expectations. We believe in cultivating an empowered engineering technical and operations workforce, and are focused on offering opportunities aplenty for their professional development to ensure that our engineering staff are well-equipped to manage our new and complex systems. At SMRT, we believe that creating a workplace that is healthy, safe and conducive to high standards of performance is everyone’s responsibility. We nurture a caring and cohesive culture supported by fair employment practices; proactively provide recognition, training and development for our people; and encourage them in their own journeys to build a rewarding life. With our people at their best, we know that our commuters are in good hands too. SMRT will give $30 million to aid those with mobility needs in our community, through a Gift of Mobility fund. This was announced by President and Group CEO Desmond Kuek at the ‘SMRT: 30 Years of Giving Appreciation Dinner’ held at SCRC on 16 August 2017. From just five stations between Yio Chu Kang and Toa Payoh in 1987, SMRT has become Singapore’s premier multi-modal land transport provider. As SMRT continues to enhance reliability and improve service standards, we are mindful of our commitment to society. We will take our Corporate Social Responsibility to a whole new level, as we mark our 30th anniversary. The Gift of Mobility Fund will allow SMRT to better serve the community and help build an inclusive society. SMRT has pledged to give $30 million in cash and contributions to aid those with mobility needs in our community. We will be able to reach a larger segment of society, in particular the elderly and commuters with disabilities, through this partnership with the Community Chest. 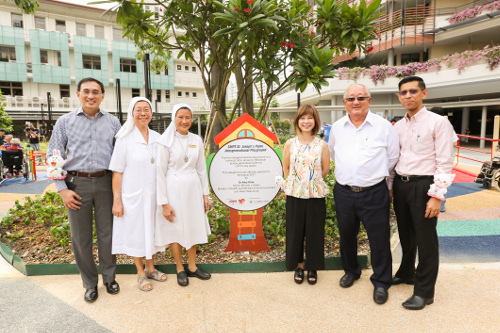 St Joseph’s Home and the Singapore Red Cross are amongst the first beneficiaries of the Gift of Mobility fund. 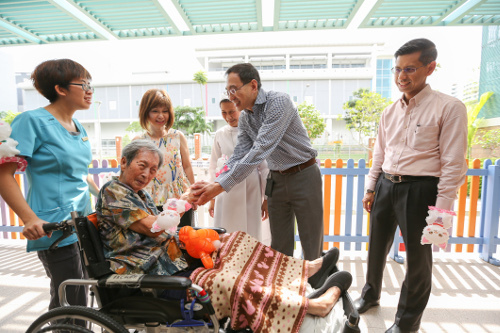 At St Joseph’s Home, a nursing home with infant and childcare facilities, an inclusive playground will allow the elderly with mobility needs to interact with children attending the childcare centres there. Singapore Red Cross’ first ‘Clinic on Wheels’ programme will bring physiotherapy directly to the elderly in our community. SMRT is also planning an innovative programme with Singtel and MINDS to improve our SMRTConnect mobile app to make land transport more inclusive and accessible for those with mobility and other special needs. There are over two million commuter rides on our trains every day. 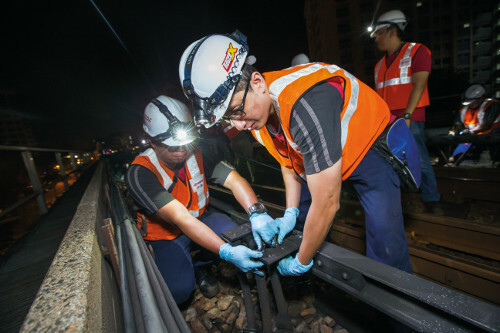 SMRT Trains is working to ensure that we bring you safe, reliable and comfortable rides every day. 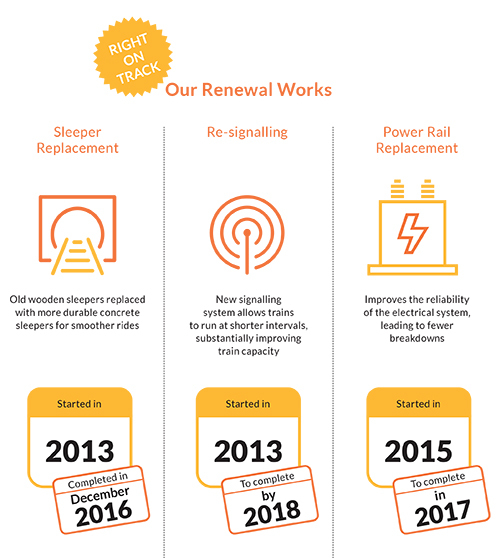 Our multi-year, multi-project efforts in renewing the North-South and East-West Lines (NSEWL) as well as our plans to increase reliability on the Circle Line and Bukit Panjang LRT are in full force. Here’s a snap shot and progress update on our ongoing renewal works. The NSEWL will receive 57 new trains by 2018, of which 45 new trains have been delivered to Bishan Depot and Tuas Depot. The trains are being fitted out and tested extensively to ensure they are certified safe for passenger service. Designed to operate with the new signalling system, we will be able to deploy more trains on the NSEWL in the foreseeable future. As we work toward improving rail reliability, we place strong emphasis on growing our operations capability. The Maintenance Operations Centre (MOC), the first of its kind in the region, was set up in 2015 to allow us to solve complex technical issues in real-time, so we can rectify track faults more quickly. The MOC has introduced new condition monitoring technologies and real-time data analytics to bolster our existing fault rectification arsenal. 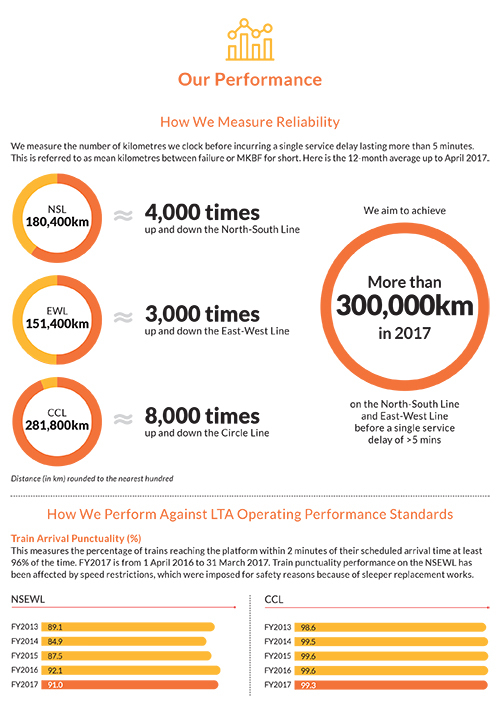 Here’s a look at how we measure reliability and how we perform against the Land Transport Authority’s benchmarks. 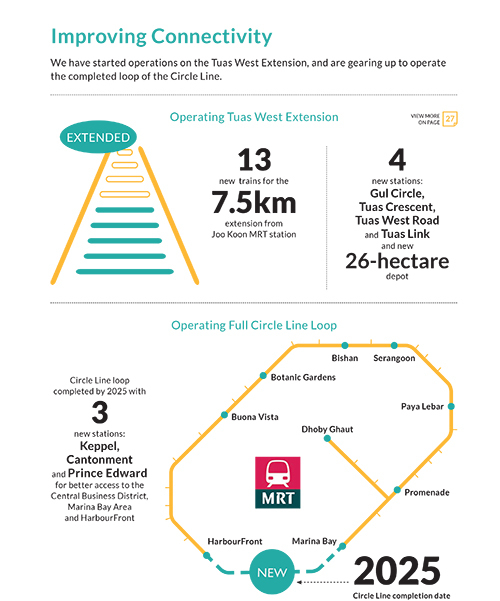 From June 2017, SMRT began operating the Tuas West Extension, an extension of the EWL from Joo Koon Station. With this, commuters travelling to Jurong and Tuas enjoy significantly better public transport connectivity.